This item is used to print a graph. The "Print" window will open after selecting this item. Settings for the graph and the printer are on the [graph] tab. Settings for the comments printed with the graph are on the [information] tab. Select [single] to print a selected graph. The graph to print can be changed by the neighbiring listbox. Or select [all] to print all the graphs in the current project. You can select the position of the graph relative to the paper mergin just by clicking one of the nine radiobuttons. You can select the scale of the graph in %. 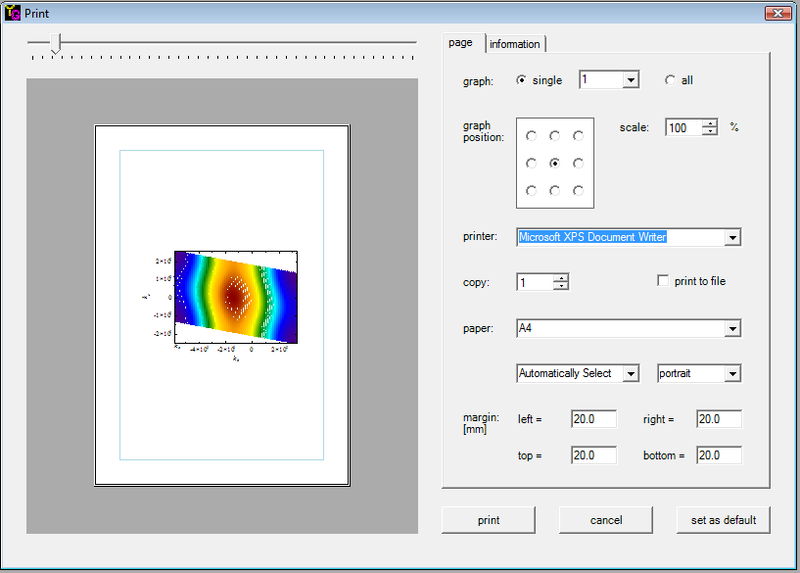 All installed printers are listed in the listbox and you can select the one used to print the graph. You can set the number of graph hard copies. Check this item if you want to print the graph to a file. All the graphs will be printed to one file when the "all" option is selected in the [graph] item. You can select i) a paper size, ii) a way of feeding papers and iii) orientation of paper which are available in the selected printer. You can set left, right, top and bottom mergins. The print area is shown as a light blue rectangle in the preview at the left side of the window. 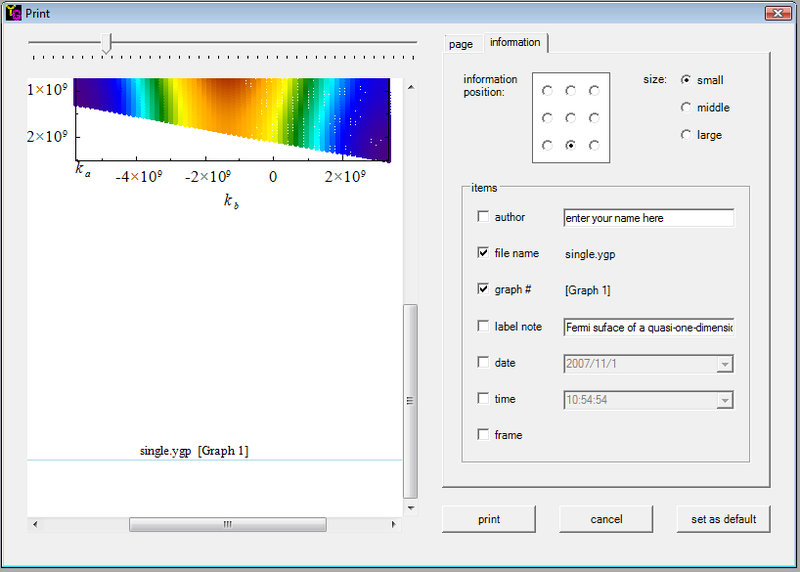 You can select position of the graph information relative to the paper mergin by clicking one of the nine radiobuttons. Three font sizes, small, middle and large are available. The font type is same as that of the x-axis scale. Select inforamtion items to print. author: You can enter author name or other comments. file name: File name of the project. graph #: Number of each graph. label note: Label note at the top of each graph Form. You can edit it through the neighboring textbox. date: The current date in a few formats selected by the neighboring listbox. time: The current time in a few formats selected by the neighboring listbox. The graph is printed by pressing this button. The "Print" window will be closed without printing the graph. The settings you make on the "Print" window will be saved as your default print style.